Wader Quest: Wader Quest Brasil. It will be predominantly in the Portuguese language of course but the aim remains the same helping to fund wader conservation projects around the world. Like us, Gislaine Disconzi is starting small so any support will be greatly appreciated. Rio Grande do Sul, Brazil 2013. Gislaine has worked for a long time in the conservation and monitoring of wetland bird species and is the Brazilian national co-ordinator of the Wetlands International CNAA (Contagem Nacional de Aves Aquáticus) project to whom we sent several records when we lived in Brazil and had the opportunity to vounteer for this project twice a year. Gislaine counting wetlnd birds for the CNAA project in Brazil. 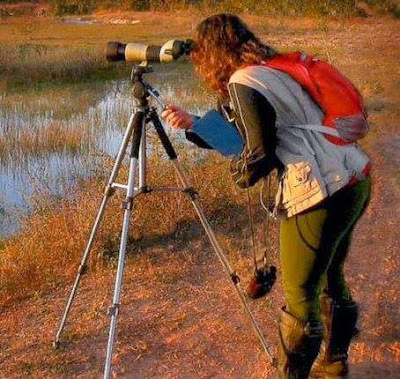 We thank Gislaine for her interest in, and support for, what we are trying to achieve and wish her and Wader Quest Brasil every success in the future.